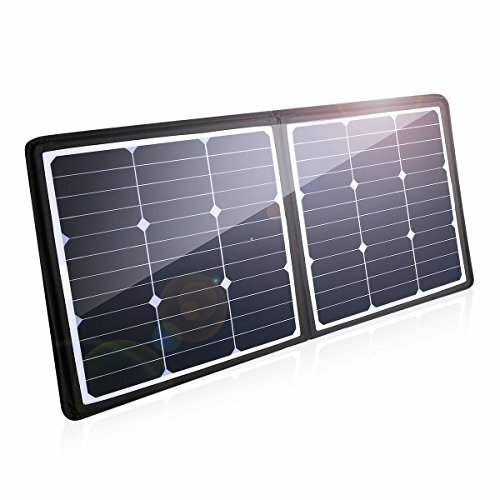 Widely Compatible: 18V 12V solar panel, 18V for laptop, camera, and other 18V voltage input devices. 12V for 150W/300W power inverter, 12V rechargeable battery and other 12V voltage input devices. USB output ports, 5V/2.7A (Max) for iPhone X/8/8 Plus, Galaxy S7/S6/Edge/Plus, Huawei P10/V10, Nexus 4/5/6, HTC, iPad, iPad Pro, MP3 and more. Portable & Light Weight: Fold size 17.7*17.7*1.6 inches, unfold size 17.7*34.65*0.31 inches, foldable solar panel bag, easy to take out with you. Light weight only 4.4 pound. What You Get: 50W PowerPort solar panel, 10 Laptop Connectors, 1*DC5521 Data Cable, 1*Micro USB cable, 1*Alligator Clips to DC Cable, 1* Car Cigarette Lighter Plug to DC Cable. 1*User Manual, 1*Welcome Card.